England’s rapidly increasing population will mean drivers in 2030 will lose an extra 12 hours a year in traffic jams, a study predicts. 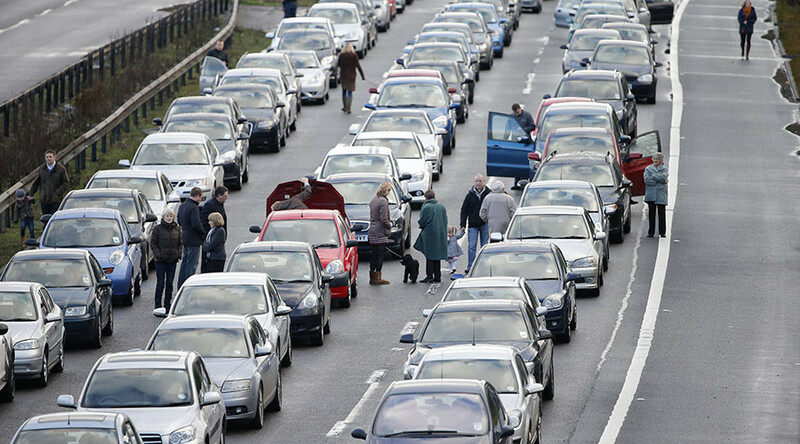 The nation’s already busy roads will be even more congested in 13 years’ time, thanks to a population boom which will see Britain overtake France as the second most populated country in Europe, according to the Office of National Statistics (ONS). The extra congestion will cost the economy £9 billion (US$11 billion), according to a new report by environmental campaign group Population Matters. With an additional 5.5 million people on the roads, the average household will lose £600 a year in extra fuel costs, more expensive deliveries and less time at work. London commuters will face the worst impact, with the average amount of time wasted annually on road journeys into the capital set to increase 15 percent to 298 hours. Trains heading into London won’t be immune either, with average rail journeys set to take an extra two and a half minutes. Population Matters supports better access to contraceptives and encourages couples to have fewer children. In a recent report, the group warned about the impact of government budget cuts to family planning in Britain. “Contraceptive services are normally financed by local councils but a cut of £200 million in central government funding to councils for public health in 2015/16 has led to a reduction in services available. Further finance cuts are scheduled up until 2021,” it states.